The PA Combo is perfect for daily and continuous use. 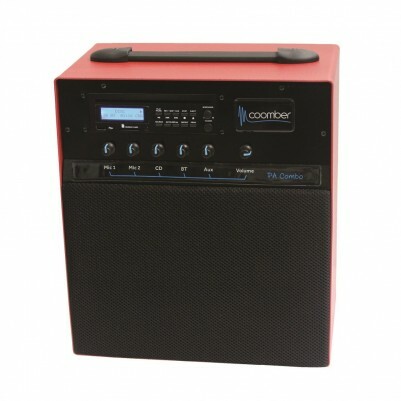 Ideal for medium sized rooms or small halls, this is the amplifier for when you need a quick and easy set up that gets you playing in seconds. The built-in Bluetooth receiver and CD player give you plenty of options so that you can play your tracks whether you have them stored on a CD, a USB memory stick, an SD card or on your smartphone. The Portable Amplifier can also be paired with microphones for crystal clear voice reinforcement in front of a small group of people. The strong metal cover is designed to protect the amplifier against the daily rough-and-tumble. So be prepared to use it over and over again for many years to come. The Portable Amplifier Combo is such a versatile unit that you won't leave your home or classroom without it. It works great if you are a teacher that needs voice amplification in the classroom or during assemblies. Don't forget to take it with you during exams time for audio playback. Add the rechargeable battery option to get some extra use out of it as you will be able to take it outside as well. Or why not present a slide show and talk over the sound track? You will be clearly heard without raising your voice. Use the remote control functions to get better control and flexibility of use. You can even slow down the audio to help students learn a foreign language or a dance routine. The Portable Amplifier works straight out of the box. All you have to adjust is the volume. The individual volume controls allow you to mix the audio inputs, whereas the master volume helps with the overall sound level.